CABA’s goal is to be a voice for the business and general aviation industry in Colorado. One of our top priorities as an organization is to be educated and involved in matters affecting our members, especially the business aviation community in Colorado who make up the majority of our organization. Our goal is to be a collective voice on behalf of our members, speaking to local, regional and state officials. Working closely with the National Business Aviation Association (NBAA), CABA has had a positive impact on a local level by communicating the value we bring our communities. 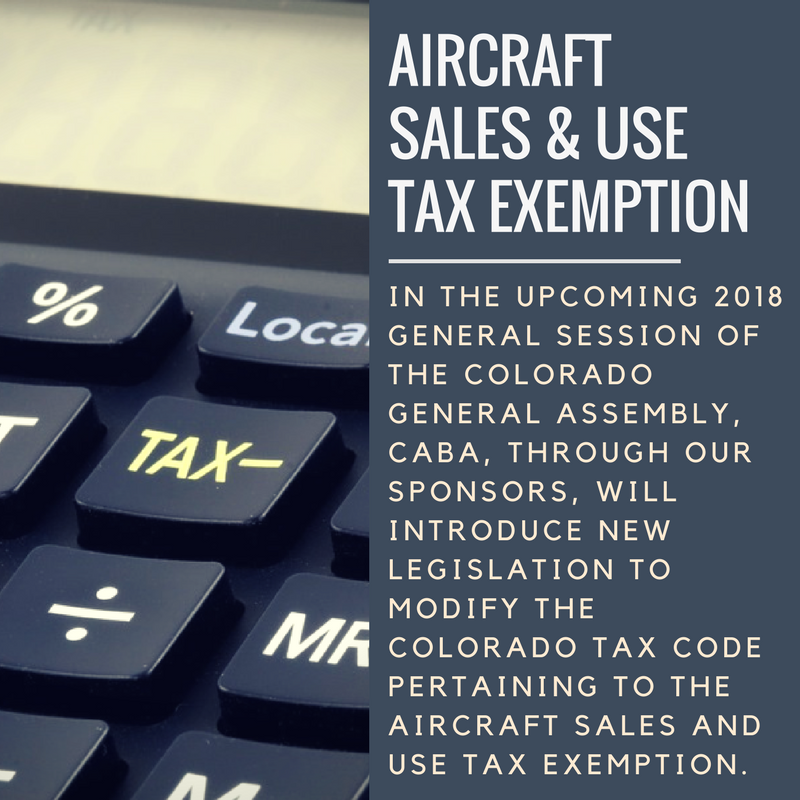 Current Colorado law exempts from sales and use tax, all aircraft used in interstate commerce by a commercial airline, and parts permanently affixed to those aircraft. This exemption applies to state, Regional Transportation District/Scientific and Cultural Facilities District, county- and state-collected local taxes. On-demand air carriers operated under 41 C.F.R. Part 135, generally fall outside of the definition of a commercial airline. Therefore, purchasers of aircraft utilized in on-demand air carrier operations cannot avail themselves of the sales and use tax exemption. To remedy this. CABA plans to introduce a straightforward bill to amend the exemption to include on-demand air carriers. Over the past few months CABA has secured legislative sponsors Senator Jack Tate and Representative Tracy Kraft-Tarp, as well as the support of the President Pro-tem and Senate Majority Leader. We continue to meet with state representatives to gain further support for the bill. Aircraft purchasers will place additional aircraft in commercial service in Colorado, which will increase jobs related to their operation. Ancillary providers to the purchase, placement and operation of charter aircraft will see more business opportunities within Colorado. Colorado has a multitude of on-demand air carriers (approximately 40) which will have access to additional aircraft. The expanded exemption will allow these air carriers an opportunity to update their fleet with newer aircraft with enhanced safety features. Colorado rural communities who rely upon on-demand air carriers for services like medical transport will benefit through additional service. Aviation in Colorado currently supports 265,700 jobs with an annual payroll of $12.6 billion and an economic impact of $32.2 billon as cited in the 2013 Economic Impact Study provided by the Colorado Division of Aeronautics. Many companies supporting these jobs will be more competitive and see increased growth through the proposed expanded exemption. A recent survey of several Colorado based on-demand air carriers, show that on average each aircraft creates 5.26 jobs to support its operation. A large cabin class aircraft requires a crew of 5 with average salaries of $550,000 per aircraft. The impact on tax revenue will be minimal compared to the overall economic benefit. Aircraft owners utilize sophisticated tax planning to mitigate sales and use tax. Often, this analysis results in owners simply basing aircraft in other states. Incentivizing owners to keep these valuable assets in Colorado and place them further down the stream of commerce through commercial service will create opportunities that justify this legislation. CABA has an open and ongoing dialogue with the FAA, NBAA and local pilot groups to help facilitate the best possible airspace design changes under the Denver Metroplex project.